The Italian sculptor, who is also known to us as an artist, Amedeo was one of the first Italian painters who traveled to Paris and back. He was friends with Matisse, Conto, Apolliner, Picasso. He was known as a hero of the Parisian bohemia. However, in spite of all this, they did not understand him. 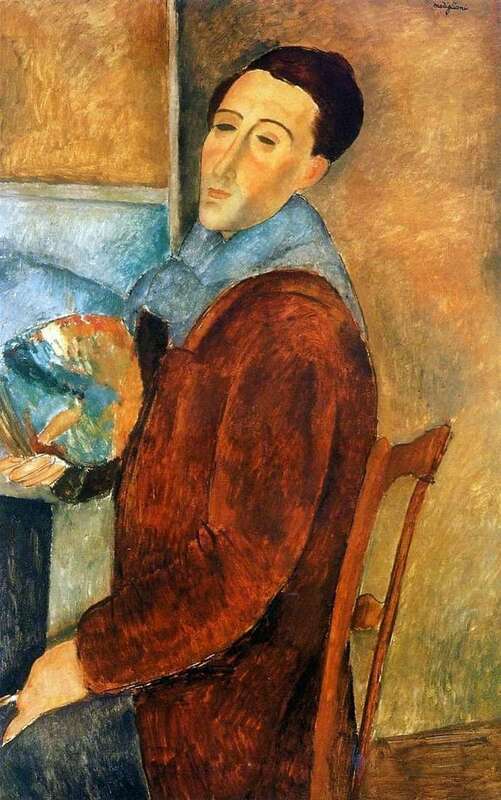 Often his friends from Paris accused Modigliani of being too committed to academicism, the traditional spirit of the Italian museum. His “Self-portrait” is written in the manner inherent to the painter – the head looks more like an elongated egg, the neck looks like a cylinder. The eyes are more almond-shaped, quite different than the real Amadeo. The silhouette, in the tradition of Modigliani, is strongly elongated, which further emphasizes the vertical size of the canvas. All proportions of the picture are far from the classics. However, the artist managed to convey his calmness, determination. The painter always prescribed all the correct features as clearly as possible. Contours do not blur. The background perfectly harmonizes with the figure of the author himself. In all the rounded corners, the artist showed his special stylistic symbols, which revealed to him the emotional fullness of nature. He wanted sincerity, remarks on the canvas. Portraits Modigliani is always distinguished by the grace of the silhouette, the author is perfectly able to show the color transitions, emotions. It seems that the whole world of the depicted person is reflected on the canvas. “Self-portrait” is written in oil on canvas, the size of the canvas is 64.5 x100 centimeters.